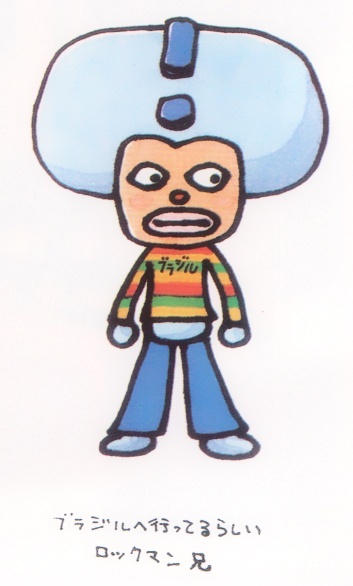 It's common knowledge that Blues is Rockman's brother (a fact that's far more blatant in the U.S canon), however, what you may not know is that Rock has another brother... living in Brazil. 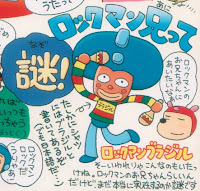 Meet "Rockman Brazil", the brain child of Rock & Rush manga artist Sakura. Though not recognized within the official canon, Brazil is prominent in a number of official Rockman and Capcom products in the form of cameos, the most noteworthy being Rockman Complete Works. 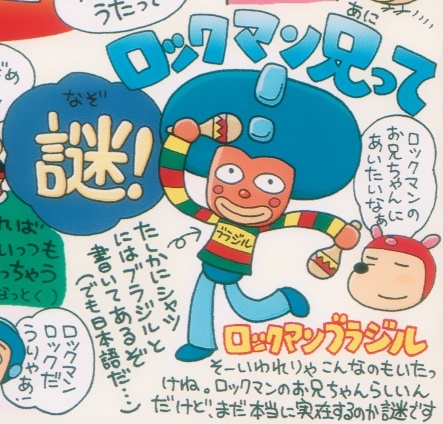 "Dressed as if he just got done marching in the Mardi Gras parade, Brazil was born when Sakura crossed Rockman with the ganguro fashion and foreign culture fascination that was sweeping Japan’s youth in the 1990s. His trademark look includes a colorful horizontal striped shirt, bell bottoms and a ‘fro-shaped helmet, along with the tan-faced white lips of traditional ganguro style. It probably goes without saying that Brazil is not the most racially or culturally sensitive character, but somehow that just fits in perfectly with Sakura’s off-color/socially inappropriate world." Brazil's very existence is a mystery, shrouded in a flurry of speculations. 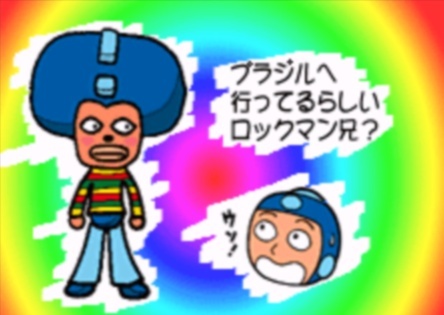 Some say he's an urban legend; others believe his true identity to be that of Rockman, dressed up for a rave. Actually, is he even a robot at all? Unfortunately, we don't have these answers, but there's plenty more info about Brazil to be had over at The Reploid Research Lavatory. Be careful: should he learn of your snooping, you might find yourself as a victim to one of his pranks. @Anonymous1: What crappy Megaman Adventure comic do you mean?? Did some company in Brazil release a Megaman comic?? Rockman Brazil, confirmed for Megaman Universe. ahaehae i dont know why brazil always spawns weird characters like blanka or THIS! come on! brazil is not only rio. i'm from a state which is bigger than most european countries. He is just very ridiculous....what is the point of this robot? Blues= Protoman and created by Wily,yes? And Rock is made by Light,how can the duo be brothers? Proto Man was created by Dr. Light and later modified by Wily, not created by him.